Think about your favorite love stories…are they real? From movie scenes? Are they written by your favorite author? In the midst of awkward imperfection comes perfect romance. We don’t watch movies or read books that end with a horrible breakup and no happy conclusion. We enjoy love stories that end with hope for a better future and hope that we could also one day find a love like that – a love that reads a notebook full of their love story every day, the kind of love that changes the beast into a man, a love that can even survive carbon-freezing in a galaxy far, far away. We do a disservice to teenagers when we encourage them to settle on surface-level, easy love. Because that’s what it is! True love, faithful love is the kind of love that sticks it out when it isn’t easy. The kind of love you really want will be hard and difficult, but it is so worth it! That is what I want teenagers to hear. Don’t settle for love that only comes around when your makeup is done or your shirt is clean – fall in love with the person who still kisses you when you have morning breath and a hole in your shirt. Don’t look for a love that completes your world – find someone who will make you better for the world. 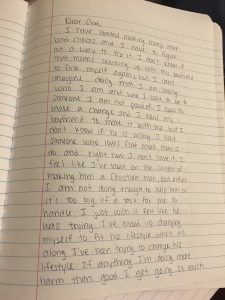 Below are images taken (with permission) from the journal of a High School girl. 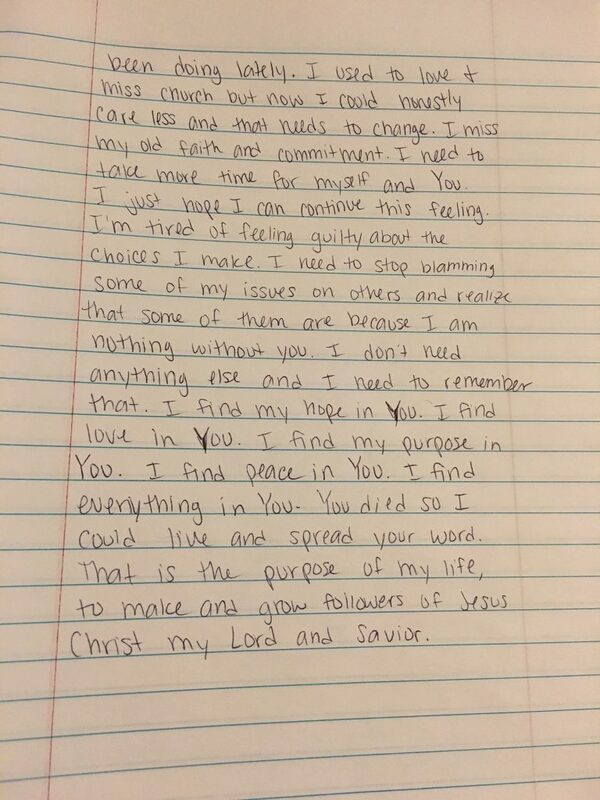 In this entry to God, she is realizing that hope, joy and purpose are not found in her boyfriend. He isn’t perfect but neither is she. I love her vulnerability and the way that she acknowledges the difficulty of finding a love that matters – in this case, a love with her Savior, Jesus Christ. So what do we do with this? 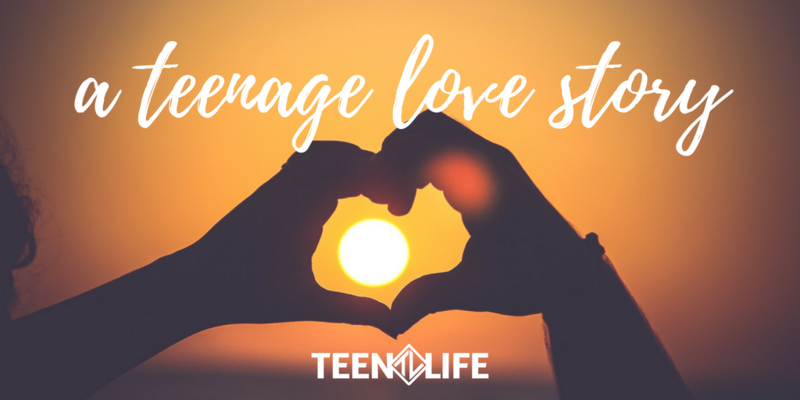 There is pain, confusion and uncertainty with all love, but especially when it comes to teenage love. Our teenagers are trying to figure out school, family, friends, extracurricular activities, and then you throw hormones into the mix and everything gets jumbled! 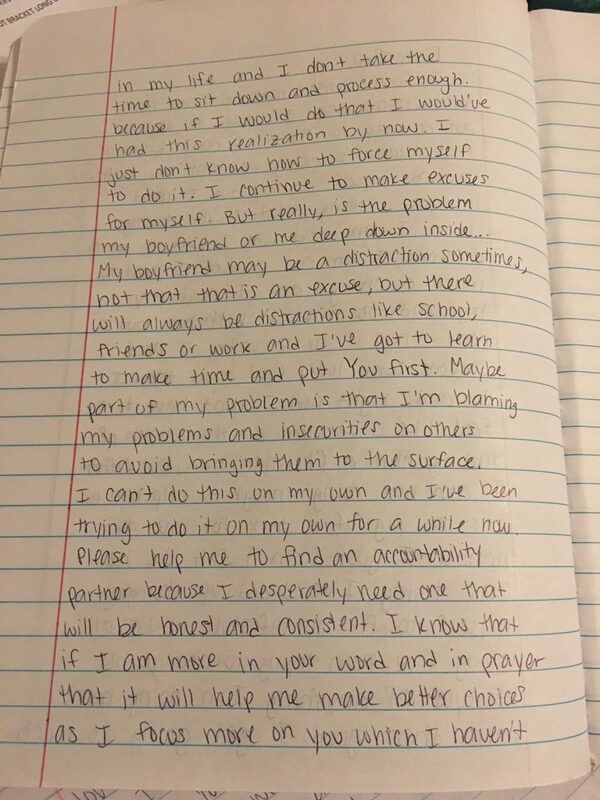 From this letter, I hope you see the importance of talking to teens about love, expectations and balancing all the exciting things (or distractions) that come with being a teen. Use the television shows, movies and books that they love to talk about the reality of love and where they should find their value. Don’t hide your own relationships from them, but model healthy, hard, real love (whether that is with a spouse, friend, or family member). As Valentine’s Day quickly approaches, I hope you will be extra sensitive to the vulnerabilities and temptations that can come with teenage love. They need you to show them what real love looks like – don’t miss the opportunity!